One of the biggest deficiencies of the Arlene Schnizter Concert Hall becomes fully evident whenever the Saint-Saëns Symphony No. 3 (the “Organ Symphony”) is on the program. The piece is famous for the organ’s entry in the second movement, when it should have a rich, full ring that just thunders, and makes you realize that it is the king of instruments. But the organ that Schnitz uses just can’t make such a statement no matter what the organist tries to do, and the Oregon Symphony had Douglas Schneider, one of the very finest organists in the Pacific Northwest at the keyboard for its concert on Saturday, April 21st for the Saint-Saëns spectacular. The organ’s sound was good enough for the gentle and hymn-like passages in the first movement, but it just couldn’t deliver the goods and make the bombastic announcement in the second. That was a shame. Still, Schneider powered up the volume for the triumphant finale, and that roused the audience to close out the evening. Speaking of the finale, guest conductor Sascha Goetzel executed a crazy gesture to get that forte at the end of the piece by extending arm upward, leaning as far back as possible, then closing it like the jaws of some huge monster. The gesture worked, but it was also very surprising because for most of the concert Goetzel seemed to have his head buried in the score and didn’t communicate much of anything to the musicians. His performance on the podium was a mystery to me throughout the evening. The other big piece on the program featured concertmaster Sarah Kwak in Karol Szymanowski’s Violin Concerto No. 1. Kwak played the piece brilliantly, fashioning rich melodic lines that created a sense of the ethereal and ephemeral. Although most of the tones were in the upper register of her instrument, including a lovely high-wire passage, she also excelled in the lower register. The orchestra played with terrific articulation to match Kwak’s, but it could have held back its volume a tad more in order to let her sound come out more strongly. The concert kicked off with Krenek’s “Potpourri,” a pieced that lived up to its name in every which way. It was a 17-minute sonic variety show that traveled through a number of different styles from unabashed orchestration that could have adorned a musical to a jaunty, Charleston-esque dance session, to a piano-infused church-like hymn, to a big Wagner-like passage, and a couple of Romantic bits thrown in. I missed a half a dozen more because they were so delightfully enticing and fleeting. The piece had one of the softest percussion sections that I have ever heard and a sparkly ending that featured principal trumpet Jeffrey Work and the trombones. On this day in 1906, Victor Herbert conducts a benefit concert at the Hippodrome in New York City for victims of the 1906 San Francisco earthquake. The SHIFT festival, a celebration of American orchestras at the Kennedy Center in Washington D.C., just completed its second year with four orchestras taking part in the weeklong festivities. I got the opportunity to hear three of the orchestras, because Music Critics Association of North America (MCANA) held its annual meeting during the festival period (April 9-15). So I enjoyed three concerts at the Kennedy Center Concert Hall by the Albany Symphony, the Indianapolis Symphony Orchestra, and the National Symphony Orchestra (I missed the Fort Worth Symphony Orchestra, which performed earlier in the week). The SHIFT festival, co-presented by the Washington Performing Arts and the Joh F. Kennedy Center for the Performing Arts, is very similar to the Spring for Music festival, which was held at Carnegie Hall from 2011-2014 in that the participating orchestras must fund their own way to the festivals and the main concert has a flat fee of $25 for all tickets. However, there are a couple of differences. The Spring for Music festival required that each orchestra sell 800 tickets for the concert whereas the SHIFT festival makes no such requirement. Also, the SHIFT festival asks that each orchestra give two or three “residency” performances in the Washington D.C. community. That does not mean that the entire orchestra has to play. It means that ensembles from the orchestra can do so. The Indianapolis Symphony Orchestra took the stage at the Kennedy Center on Friday (April 13th) under the baton of its music director Krzysztof Urbanski, who chose a program of works from his native Poland. He started with a mesmerizing “Orawa” for string orchestra, based on Polish folk dance by Wojciech Kilar. Then things got deeper with an amazing performance by Alisa Wellerstein in Witold Lutoslawski’s Cello Concerto, followed by Krzysztof Penderecki’s “Credo.” The Penderecki piece took up almost all of the real estate with a large orchestra, five soloists, the Indianapolis Symphonic Choir, and the Indianapolis Children’s Choir. The soloists, soprano Erin Wall, mezzos Renee Tatum and Alyssa Martin, tenor Thomas Cooley, and bass Liudas Mikalauskas, sang with commitment, but Cooley pushed his voice out of bounds on some high notes. One of the best things about the National Symphony Orchestra’s concert was the number of youth in the audience. It looked like at least a third of those in attendance were in college or high school. Music director Gianandrea Noseda put together a tribute to the great Russian baritone, Dmitri Hvorostovsky, who had been originally scheduled for the concert. Each of Noseda’s selections had a strong Russian-Italian connection. First was Stravinsky’s “Pulcinella” after Pergolesi with soprano Madison Leonard,tenor Rexford Tester, and bass Andrew Bogard. Next came Balakirev’s “Islamey” in the arrangement by Casella with a very-full-sized orchestra (8 bass violins) that sort of blurred the tones when the full contingent was going a top speed. That was followed by five of Rachmaninov’s “Etudes-Tableaux” in an arrangement by Respighi. The musicians excelled the most with the Rachmaninov, conveying sounds from the soothing seashore, a lively fair, a funeral march, a lively Little Red Riding Hood and a howling wolf, and a high-stepping march to wind things up. For the reviews of these concert, I gladly refer you to those posted by my colleagues in the Classical Voice of North America. What a joy it was to be in attendance at the first performance of the “Bach B Minor” that Trinity Music and the Portland Baroque Orchestra performed on Friday (April 13). Trinity Cathedral was packed to the brim. It would be interesting to find out from attendees what, exactly, were their reasons for being there. As Canon Matthew Lawrence remarked in his opening welcome, “This is a sacred space.” And sacred spaces are for anyone. All are welcome! So, whether or not this was a “spiritual” experience, as it certainly was for me, or not, it was an honor to be with all the others Friday. This monumental work was presented with an intermission, which no doubt was a practical consideration; but I would have preferred an uninterrupted performance. Sure, it would be a long time in a sitting position, but the whole thing is “of a piece.” A few weeks ago, the Oregon Symphony performed Verdi’s "Requiem" without an intermission and I didn’t hear any complaints in the restroom afterwards! The arrangement for a large-scale work such as this in a worship-space is problematical and this was coped with rather well. The soloists had to move forward from a side position when they sang, and members of the choir had to reposition themselves from their seats to where they would sing. But none of this was distracting. At first, I thought that moving the altar to one side, as it is for organ recitals sometimes, and having all the performers on the altar-level would have been better for the overall performance. But the acoustic is such that, if the choir are forward, the effect is better for the listener in the nave. Visibility of the performers was difficult as well. But, the altar stayed in place, thus emphasizing that the “B Minor,” concert-piece that it is, is very much a mystical, spiritual experience and calls for an appropriate setting. Bruce Neswick, Canon for Cathedral Music at Trinity, introduced the performance and its conductor, David Hill, conductor of the Yale Schola Cantorum and the Bach Choir of London, as well as other distinguished positions in Leeds and Bournemouth. In doing so, Canon Neswick mentioned that it was a performance of the "Bach B Minor Mass" by the Bach Choir in 1847 that heralded the revival of this massive work. For me, openings of large choral works always thrill and the opening of the Bach when the tenors begin the massive fugue in the Kyrie is no exception. It reminds me of the opening of the "Mozart Requiem" with the clarinet’s pungent introduction to the choral exclamations of Requiem aeternam and Kyrie. I sat mesmerized and almost in tears. The careful enunciation of the text, taken up by the altos, then the first sopranos, then the second sopranos, and finally the basses, etched an indelible impression upon me. The care that singers and players gave to the entire production was admirable, and many things stand out. First, the singers: all five soloists were outstanding. The two sopranos, Trinity’s own Arwen Myers and Estelí Gomez sparkled especially in their duet in Christe eleison, German tenor Nils Neubert shone in the Benedictus and the bass Jesse Blumberg stood in the pulpit for Quoniam tu solus sanctus, declaiming the Most High in an expressive fashion. He also executed the wide range necessary to sing Et in Spiritum Sanctum in the Credo. Countertenor Daniel Moody’s crisp, clear (and high!) blessed instrument rang out in all of his arias. The whole ensemble alternated with the choir, providing a wonderful contrast in two places in the score. Members of the Portland Baroque Orchestra were at their best, accompanying the Trinity Choir and the soloists, carefully tuning often. The solo violin (Carla Moore) in Laudamus te, playing 32nd notes with great ease, was a complement to the excellent singing of the soprano. Janet See, playing a wooden transverse flute, stood out in the Benedictus. But the surprise of the evening was hearing—and seeing—Andrew Clark play a corno da caccia in the Quoniam. This remarkable instrument has a bell that seems like it is a mile from the rest of the horn, and Clark played from memory using only his embouchure (lips, as there are no valves) to bring off this difficult music. As a choir singer myself, I’m always on the lookout for how a choir works with a conductor, particularly one who is a guest, such as Mr Hill. The choir was expertly prepared by Canon Neswick and his assistants, Christopher Lynch and Arwen Myers (one of the soprano soloists) well in advance of this performance. Hill had only three rehearsals last week before the first performance to bring his particular skill and expertise to the group, and the final result was stupendous. It was noticeable that a few times the conductor pointed to his eye as though to signal the chorus to watch him more closely, and a few singers were careful about that. However, having sung this work before, I would have to say, “This is a lot of music!” It is also complex and requires the utmost in attentiveness to notes, dynamics, shaping of sound, and the conductor’s requirements. So, noses in music result! It must also be said that this choir is made up of both professional singers, many of whom are salaried, and “your regular amateur” singer. (Remember that “amateur” means “lover.”) Also, the choir had just come off of a heavy Holy Week and Easter schedule, singing for all the liturgies that go with it. A small omission in the program was that of the organists’ names who played with the continuo: none other than Bruce Neswick and Chris Lynch. Two outstanding moments come immediately to mind to acknowledge the choir’s hard work: (1) Crucifixus was stunningly sung, the ending quietly elegant; (2) Dona nobis pacem at the work’s conclusion was glorious. During this movement, I was immediately reminded of two recent events, one global and the other local. The global: President Trump’s announcement that very day (Friday) of the missile strikes in Syria; the local: carrying my sign at the March 24 anti-gun demonstration downtown which read: “Dona Nobis Pacem!” Give us peace, now and always! One of the best things about the Oregon Symphony concert on Saturday evening (April 7) at the Arlene Schnitzer Concert Hall was how well John Corigilano’s percussion concerto, “Conjurer,” complimented Maurice Ravel’s ballet music, “Daphnis and Chloe.” The Corigliano piece, featuring the orchestra’s artist in residence, Colin Currie, was remarkably subtle and soft, which allowed the Ravel to be more expansive yet maintains its refined character. Corigilano divided “Conjurer” into three movements defined by types of percussion instruments. The first, “Wood,” offered an array of pitched wood instruments such as the marimba, xylophone, and wood blocks that Currie tapped, struck, hammered, prodded, and scratched. The assortment of tones, separated at times by brief pauses, worked especially well against the string accompaniment. In the second movement, “Metal,” Currie created a layered web of sounds by playing the vibraphone, cymbals, tubular bells, and tam-tams (gongs). The notes seemed to lengthen and then decay into a contemplative and almost static stance. The third, “Skin” involved several drums, including timpani and a big bass drum that Currie played with his hands rather than with drumsticks. Accented with kick drum and sporadically charged up by the orchestral brass, the music became stirred up before it all subsided and settled down with little pauses to almost mirror the beginning, as if coming out of nowhere. Unlike previous percussion concertos, Currie didn’t have to dash between the large setups of instruments. Between the first and second movements he seemed to move in slow motion from on percussion battery to the next while Music Director Carlos Kalmar kept conducting, and that caused some chuckling from the audience. The orchestra has performed the suite from “Daphnis and Chloe” many times, but the concert marked the first time that it chose to do the entire hour-long ballet. Because the music tells a idyllic love story of a shepherd and shepherdess (with some pirates tossed in), it would have been advantageous to have some supertitles to indicate each movement. Otherwise, it was easy to close one’s eyes and ride the sonic ebb and flow and picture a seascape with birds flying about. But Ravel did have the story in mind, and the sensuous arabesques of sound were nonetheless deftly delivered by the orchestra, including a wonderfully effective wind machine (aeoliphone) in the percussion section and choruses from Portland State University (prepared by Ethan Sperry). Aside from the lush and gorgeous sound of the orchestra, high points included the “Grotesque Dance of Darcon,” which had a wonderfully odd wa-wa from a trio of trombones. Another point was the percussive slap that shot over the orchestra to signal the abduction of Chloe. Virtuosic playing from Concertmaster Sarah Kwak, and principals in the woodwinds and brass added to the enchantment. Overall, the strings shimmered, the myriad of ascending and descending lines flowed like a rushing stream, and the final sonic abandon brought the piece to a fantastic conclusion. The choruses, consisting of the Portland State Chamber Choir, Man Choir and Vox Femina, were confined to the loft area behind the orchestra, which was disadvantageous, because their sound, while blending nicely with the instrumentalists didn’t have a lot of volume or intensity. More singers would have given the performance the requisite sonic weight to make the evening more memorable. On this day in 1931, Copland's "A Dance Symphony," was premiered by the Philadelphia Orchestra conducted by Leopold Stokowski. This work incorporates material from Copland's 1923 ballet"Grohg," which had not been produced. The symphony was one the winners of the 1929 Victor Talking Machine Company Competition Prize. The judges of the competition decided that none of the submitted works deserved the full $25,000 prize, so they awarded $5000 each to four composers, including Copland, Ernest Bloch, and Louis Gruenberg, and gave $10,000 to Robert Russell Bennett (who had submitted two works). Many readers of Northwest Reverb know that I am a member of the Music Critics Association of North America. The group, which has a roster of just over 100 classical music critics has a national online magazine called the Classical Voice of North America (CVNA). Last year, MCANA announced its inaugural Best New Opera of North America Award, and this it followed through with its second annual award. MCANA has an awards committee, which determines which opera will receive the award, and I was asked to write an article to announce the award and interview the winner. This year's winner is "The Wake World" by David Hertzberg, who wrote the music and the libretto. You can read all about it in CVNA here. I am leaving on Wednesday to travel to Washington D.C. where MCANA will officially present the award to Hertzberg. The members of MCANA are meeting in D.C. for our annual conference and to take in the Shift Festival at the Kennedy Center. 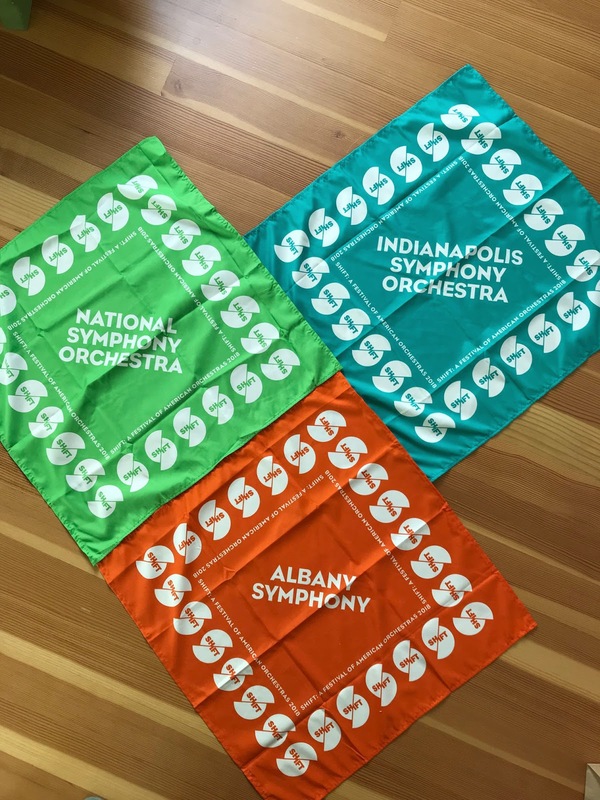 From Wednesday evening through Saturday evening, I'll hear the Albany Symphony, the Indianapolis Symphony, and the National Symphony. MCANA will also host a number of panels that will feature various critics and folks who are involved in arts administration. I am especially interested in meeting Debrah Rutter, CEO of the Kennedy Center. I will keep you posted as events progress.